The world of the owl has fascinated even those of us who aren’t avid birdwatchers. Normally unseen, the cold months brings them visibly into our world as scarce food encourages daytime feeding. Some will leave the forests and can be found hunting along marshland or coastal dunes - on the lookout for prey which becomes harder to find in the now frozen uplands where they spend the summer. With just five species of owl in the UK (along with a couple of visitors), winter is the best time to tick off each one from your list. ​Short-eared owls make a temporary move to the coast from their summer home. Some of the short-ears we see during the day and along the east coast will have come from Scandinavia, but it’s thought most of ours prefer a ‘staycation’, moving from the northern uplands further south. Long-eared owls are harder to find. During the day they settle in dense vegetation, where their mottled brown feathers makes them well camouflaged. Often, they’ll sleep in groups, waiting until nightfall when they will fly out to hunt for small mammals and birds. Barn owls don’t leave their home ranges in winter but hunt during the day when food is in short supply and their prey (mostly voles) become more active. One energy-saving hunting strategy is to quietly wait on a fence post, looking and listening for a rustle in the grass instead of flying in the chilly air. Young barn owls are on the prowl for new homes; after being forced to leave their parents range at just three and a half months old, they’ll find a nearby spot to call their own. The classic nocturnal call of the tawny owl is another herald of challenging territories. The females “keewick” is answered by the male’s “ooo-ooo-ooo” and is used to signal the start of breeding season for these birds. Introduced to the UK in the late 1800s, little owls quickly spread across the country from their reintroduction stronghold in Northamptonshire. These amusing characters eat beetles and worms, as well as small mammals, and run along the ground to chase their food. They’re another owl which hunts during the day and may be spotted sat on a favourite perch near a nest site. Better known for its spectacular and cacophonic seabird colony during the summer, Bempton is the place to be in winter for owls. Barn and short-eared owls arrive on the reserve from chillier places and hunt in the fields. 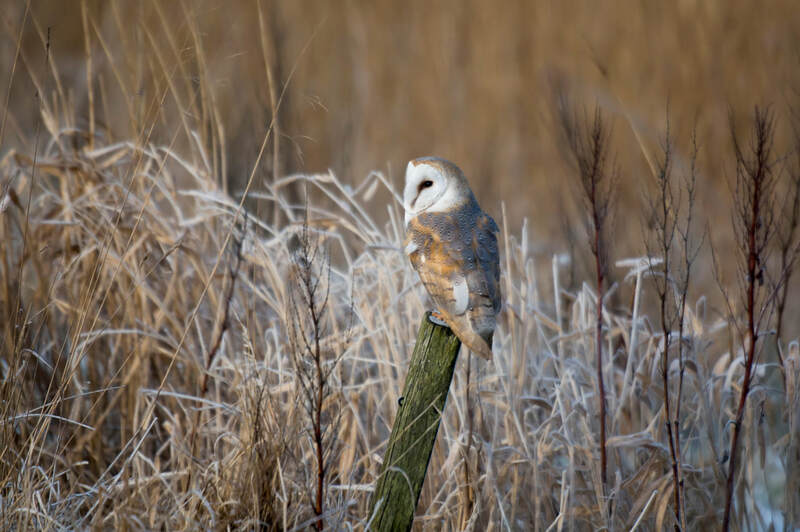 There are several barn owl territories around RSPB Blacktoft Sands, near Goole on the Humber Estuary. On winter afternoons they hunt over both the reedbed and grazing marsh areas and you may be rewarded with a close fly past in front of the hides. There is also the bonus that you can watch large numbers of marsh harriers coming into roost (often over 20 birds). A very obliging long-eared owl has overwintered at Dungeness in Kent for the last few yearsand is often visible from the reserve’s visitor centre. North Kent Marshes host two nature reserves where all five species can be found. Barn, tawny and little owl are present all year round - joined by short-eared and long-eared in the winter. It’s not unusual to see little owls sunbathing on the rocks at the quarry at Sandy Heath just across the road from the RSPB headquarters. Just follow the path from the quarry road to the steps and continue along the trail east.